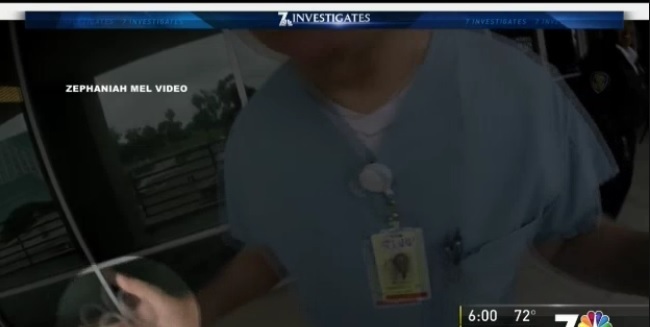 A California abortionist has agreed to surrender his medical license after allegations of over-prescribing opioids and other controlled substances, botching an abortion, and unprofessional conduct during an altercation outside an abortion facility. Dr. Robert John Santella, who surrendered his licensed this month, commits abortions at the Family Planning Associates (FPA) facility in San Diego. The Medical Board claimed Santella over-prescribed narcotics to six patients and botched an abortion on another patient. The Board also cited Santella’s “aggressive” and “outrageous” behavior outside the Family Planning Associates abortion clinic on Miramar Road in June 2016 as a cause for revoking his license. In the accusation, the Medical Board’s executive director said Santella’s “outrageous conduct” and “physically threatening gestures” violated his profession’s ethical code, and demonstrate Santella is unfit to practice medicine. In detailing Santella’s “gross care” in the treatment of several of his patients, the Board noted that Santella failed to maintain accurate records and failed to document “a clear medical indication” for prescribing the controlled substances in question. And, in some instances, Santella also failed to document that the drugs had been administered along with the reasons why they were prescribed. In September 2015, Santella committed a second trimester abortion on a patient at FPA and indicated in his notes that all “products of conception” had been accounted for. 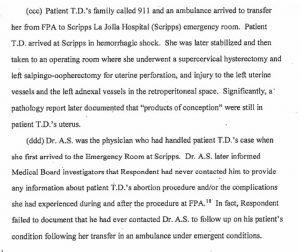 The Board of Medicine’s document indicates that during the abortion procedure the patient had “suffered significant blood loss,” requiring treatment to stop the hemorrhaging. Despite the media’s false narrative that abortion workers are always caring and compassionate, this case reveals that the opposite took place. 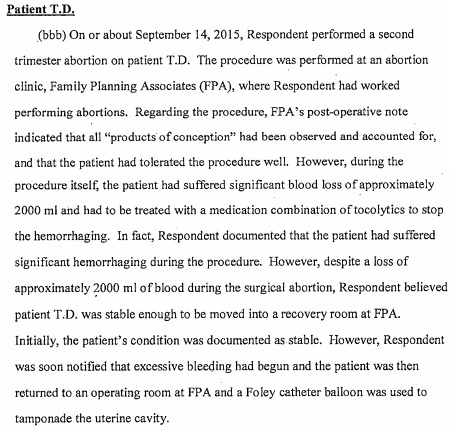 The document notes that despite the significant loss of blood, the abortion patient was marked as “stable” and was then sent to FPA’s recovery room. As has been described by others once involved in the abortion industry, this lack of regard and rush to get to the next patient is common, as the goal is to commit as many abortions as possible each day. In this incident, while the patient was in recovery, someone there noticed the bleeding. But instead of calling 911, the abortion patient was returned to the abortionist for further treatment. Eventually, the woman’s family called an ambulance, and she arrived at the hospital in hemorrahagic shock. There, the woman underwent intensive surgery where doctors found that pieces of her preborn child were still inside her uterus. Even more troubling – but most likely normal within the abortion “profession” – is the fact that Santella never contacted emergency room physicians to provide them any information about the abortion or conditions leading up to the patient’s hospitalization. The only information received by emergency room staff came from the woman’s family, not from Santella or any abortion facility staff. The mother had been angry because Santella refused to let her see her daughter even though her daughter was calling for her in obvious distress. The patient was hospitalized for eight days. She received a hysterectomy and suffered an infection. Mel said he backed away from Santella, and ended up very close to the railing on the second-floor walkway where the confrontation took place. Despite the allegations against him, the California Board order states that the surrender of Santella’s medical license will become effective on December 31, 2017.